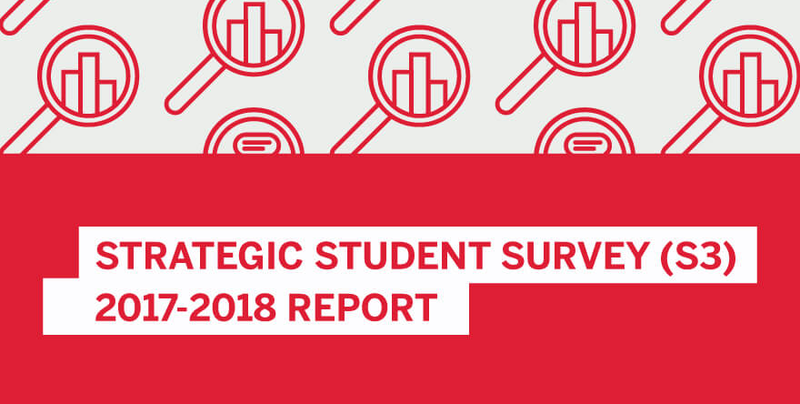 The Strategic Student Survey (S3) was developed in collaboration with IU School of Medicine students, staff and faculty on all nine campuses as a holistic way to obtain actionable student feedback on areas that the school aims to improve. The S3 also compares student experiences across all four years of training to track continuous program quality improvement and identify areas that require rapid interventions. The S3 complements national Association of American Medical Colleges (AAMC) questionnaires such as the Graduation Questionnaire (GQ), which provide vital benchmarks to show the educational experience areas IU School of Medicine needs to improve relative to other medical schools. Along with course and clerkship evaluations, national AAMC questionnaires and the S3 provide effective outlets for students to impact their educational experiences, engage with school leadership and leave a legacy that improves future student experiences. This report utilizes quantitative and qualitative methods to displays results from the S3 administered to students in early spring 2018. Each training year class received an S3 questionnaire designed specifically for the class. The overall response rate across all four class years was 82.4 percent, making the results representative of the collective student body experience. Diverging stacked bar charts are used to represent the percentage of dissatisfied and satisfied student responses for each S3 question. Dissatisfied responses diverged left from the center of each bar and satisfied responses diverged right from the center of each bar. A qualitative evaluation program determined which student response themes and comments are most representative of each class year as a whole. A composite student persona represents these themes and comments for each class year. While these fabricated student personas cannot reflect all student opinions, they do represent significant themes and real—but redacted and anonymous—student quotes. To increase transparency and accountability, this S3 project report also includes responses from IU School of Medicine l administrators detailing how they will use student feedback to and address concerns and ensure continued success. Across the class years there are many positive trends indicating improved program effectiveness and student satisfaction. While the school will never stop working to improve, it is reassuring to see student satisfaction increasing over time as programs improve. ​Student satisfaction with adequacy of the school’s mistreatment policy increased 13 percent. ​Student satisfaction with the accessibility of services from the Office of Medical Student Education increased 9 percent. When looking at these trends, it is important to consider context. For example, Class of 2018 students were among the first to be matched with a lead advisor. The boost in student satisfaction with the Class of 2021 indicates that—with the help of student feedback—the lead advisor program has improved dramatically over the years. The Strategic Student Survey (S3) aims to gather meaningful feedback from IU School of Medicine students to improve student learning experiences. The S3 was developed collaboratively by a committee of students, faculty, administration and evaluation professionals. The S3 asks IU School of Medicine students important questions about areas such as teaching and learning, academic advising, career counseling, and student well-being. The S3 is intentionally designed to meet the specific needs of each class year. For this reason, a unique set of questions are used for first, second, third and fourth-year IU School of Medicine students. Some questions are repeated across all class years so that improvement can be tracked over time. The 2018 S3 was administered by Qualtrics, an online survey management program supported by Indiana University. All survey responses are anonymous, and no identifying information was collected. 2018 S3 data was downloaded and stored securely on a password-protected and encrypted IU server. Quantitative analysis software programs including SPSS and Tableau were used to analyze data and report descriptive statistics on percent of dissatisfied and satisfied students. NVivo 11, a qualitative theme analysis, was used to examine students’ open-ended comments and identify common themes for each class year. These themes were subsequently used to help create student qualitative comment composites, with redacted but authentic student quotes. The S3 project will continue to be a platform for student and administrative dialogue each year. For the project to remain valuable, input from students, faculty and administrative leadership across all nine campuses is needed. To participate or provide feedback about the project, please contact the Office of Medical Student Education’s Planning, Assessment and Evaluation team at msepae@iu.edu.